PLAY with HONOR is intended to be a constant reminder that we are thankful to those that provided the things we have today. We want those who fought for us to feel appreciated every time they see us wearing “Play with Honor” apparel. Can we ever say thank you enough to our soldiers, our parents and grandparents, our teachers and anyone else who has “fought” to give us the lives we have? When we wear our PWH apparel, we are spreading a message of thanks for the world to see. The Rico Foundation was formed to provide assistance to players and programs that have limited resources and to help bring softball to those with the desire to play. With the contributions of our donors, we have been able to help with the costs of training, clinics, equipment and travel for players locally and internationally. We also have been able to assist with upgrading and repairing some of the fields and facilities at our local high school programs. 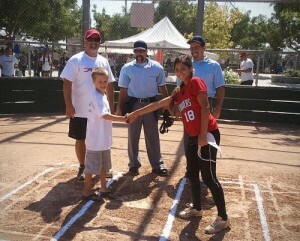 In 2012, the Rico Foundation’s first year, we contributed to the Noah’s Heart Foundation, and also sponsored a clinic put on by the AIGA Foundation for Polynesian softball players in Lakewood, CA. The Rico Foundation sponsors players who aspire to compete internationally and promote the cause of fastpitch softball across the globe, such as Colombian national team player Juliana Forero. The Foundation has provided housing and training for Juliana as she prepares for play on a worldwide stage. Juliana will be returning in January 2013 to head the marketing department for Firecracker Softball and Play with Honor apparel and gain valuable experience that will help her to achieve her life’s goals. Without the support of our donors and friends, the Foundation could not be working to make these and other great things possible.